This week Sunshine State Counseling Center is discussing the benefits of Sandtray in Therapy. Sandtray is an expressive tool that allows for direct demonstration and expression of one’s own emotional and mental experiences without having to use verbalization. This tool in psychotherapy involves the processing of intra- and interpersonal issues with sandtray materials as a nonverbal medium of communication. Why use Sandtray in Therapy? Creative expression: Sandtray in therapy allows for the expression of nonverbalized emotional issues, while given the opportunity to explore new possibilities, which may not be possible through verbal expression. The use of the sandtray in therapy assists in providing an environment full of self-exploration and self-expression that incorporates symbols that allow one to channel expression beyond the use of words. 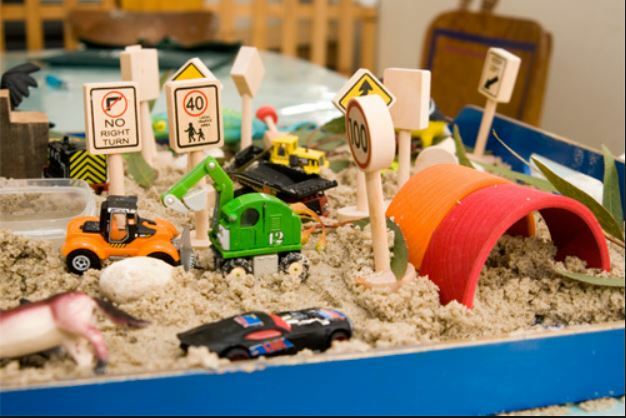 Boundaries and limits: Sandtray in therapy naturally provides a safe and controlled environment. The sandtray is a safe and protected space, while the symbols (objects) hold a focus for a symbolizing function. Due to the absence of interpretation and minimal verbal comments from the therapist, there can be a decrease in feelings of fear and engage fully in expression to work with their implicitly held experiences. Sensory and symbolic therapeutic method: Because the sandtray is a symbolic means of expression, the objects involved represent all aspects of life, humans, animals, mythology, fantasy, nature, and more. The only skill needed is the ability to move the objects and allow the imagination to speak and share its story.